Clint Eastwood is a Hollywood legend. Starring in films since the mid 1960s, his tough, quiet approach to life's problems made him an international icon. His films have been so successful, that he became another (after director Stanley Kubrick) darling at Warner Bros.; the studio now allows him to make anything he wants to make. Of English, Irish, Scotch and Ducth ancestry, Eastwood can trace his family back to a passenger on the Mayflower. His father worked as a laborer, causing the family to move often. During Clint's high school years however, the family settled in Piedmont, California, and lived the good life for awhile. An apathetic student, Eastwood dropped out of high school and, like his father before him, worked odd jobs until he was drafted into the U.S. Army, where he spent the Korean War doing odd tasks at Ford Ord. 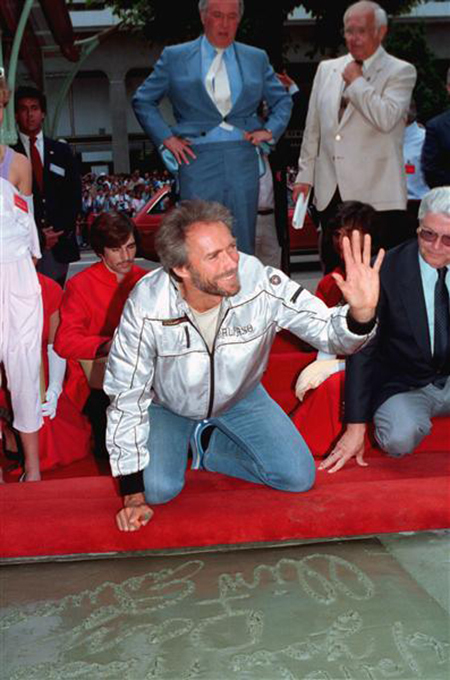 While there, a film company was making a film on base, and an assistant director got Eastwood to make a test in Hollywood for director Arthur Lubin. He was given an acting contract — and acting lessons. His first part for Universal was in Revenge of the Creature (released in March 1955). Dropped from his acting contract in October, 1955, Eastwood went searching for an agent. This process got him several guest slots on television shows like Highway Patrol, aired in syndication in April, 1956, where he played a motorcycle gang leader, and a crazy gold prospector on Death Valley Days, aired in syndication in December, 1956. With his new agent, Eastwood got thrid billing in the western Ambush at Cimarron Pass (released in March, 1958), but Eastwood disliked the picture. His big break came from being cast as cowboy Rowdy Yates on Rawhide for 216 episodes, aired over CBS from January, 1959 to December, 1965. The producers didn't pay Eastwood very well, so even though the show was popular, he took the lead in a western an Italian director named Sergio Leone was making. Instead of playing an innocent cowpuncher, Eastwood created a more complex character — the Man with No Name. Per un pugno di dollari - A Fistfull of Dollars (released in December, 1965 in Italy; in May, 1967 in the U.S.), made Eastwood a star in Italy; Per qualche dollaro pui - For a Few Dollars More (released in September, 1964 in Italy; in January, 1967 in the U.S.), was rushed into production. the third installment, Il buono, il brutto, il cattivo - The Good, the Bad and the Ugly (released in Italy in December, 1966; in December, 1967 in the U. S.), became a huge hit internationally. With the money from these "spaghetti" westerns, Eastwood established his Malpaso Productions which made Hang 'Em High (released in August, 1968); Eastwood got a share of the gross — the picture was a large hit. Eastwood could now take chances on his pictures; he co-starred with Lee Marvin in the musical Paint Your Wagon (released in October, 1969), with Lee Marvin. Eastwood's signing failed to impress anyone. Working within his own production company from now on, Eastwood and director Don Siegel made The Beguiled (released in March, 1971), with Geraldine Page, which unfortunately flopped. Undaunted, Eastwood directed his first film Play Misty for Me (released in November, 1971), then, working with Don Siegel again, made his second signature role — that of police detective Harry Callahan in Dirty Harry (released in December, 1971); it became a career-difining monster hit. Returning to the western form, director John Sturges guided Easstwood through Joe Kidd (released in July, 1972), with Robert Duvall, but Eastwood took the director's chair for High Plains Drifter (released in August, 1973). Eastwood took a low-budget chance on the love story Breezy (released in November, 1973), with William Holden, but the picture didn't do well. Returning to his "Make one for them, then, make one for yourself," Eastwood returned as Harry Callhan in Magnum Force (which played the Chinese in December, 1973). This did well enough for him to star in and direct The Outlaw Josey Wales (released in June, 1976), which has since become a respected western. More hits followed, including Every Which Way But Loose (released in December, 1978), and Escape from Alcatraz (released in June, 1979). The winsome Bronco Billy (released in June, 1980), more-or-less flopped, but Eastwood's return again as Dirty Harry in Sudden Impact (released in December, 1983), was a predictable hit. 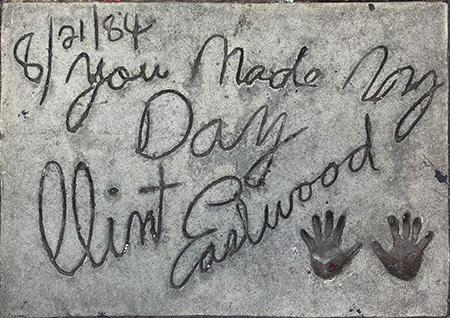 Eastwood was finally asked to make his imprint at the theatre when Tightrope (which played the Chinese in August, 1984), was showing at the theatre. 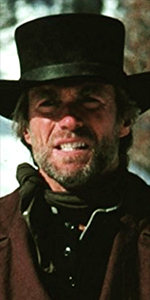 Eastwood was one of the biggest stars in the world now, and he continued to explore western themes in films like Pale Rider (released in June, 1985); the military in Heartbreak Ridge (released in December, 1986), with Marsha Mason, and he directed Forest Whitaker in a biopic of jazz musician Charlie Parker in Bird (released in September, 1988). He made a film about big-game hunting in Africa, White Hunter, Black Heart (released in September, 1990), which no one went to see. All that was forgotten in the wake of Eastwood's remarkable western Unforgiven (which played the Chinese in August, 1992), with Gene Hackman. The powerful film brought Oscars for Best Picture and a Best Director to Eastwood. He followed this up with a stellar turn as a secret service agent in director Wolfgang Petersen's In the Line of Fire (released in July, 1993), with John Malkovitch, and finally played to the female audience in The Bridges of Madison County (released in June, 1995), with Meryl Streep. Eastwood continued to direct almost all of the films he starred in, as well as other pictures, like Midnight in the Garden of Good and Evil (released in November, 1997), with John Cusack. He starred in and directed Space Cowboys (released in August, 2000), with Tommy Lee Jones, then helmed the intense crime film Mystic River (released in October, 2003), with Sean Penn, who won an Oscar for his performance. Speaking of Oscars, Million Dollar Baby (released in December, 2004), brought in Eastwood's second Best Picture and directing Oscars with Hillary Swank winning a Best Actress Oscar — be warned — it's a fifteen-hankie movie. His two films one the Battle of Iwo Jima were told from the perspective of the Americans in Flags of Our Fathers (released in October, 2006), with Ryan Phillippe, and then from the perspective of the Japanese in Letters from Iwo Jima (released in February, 2007), with Ken Watanabe. All tough, hard-hitting films. So too is Gran Torino (released in December, 2008), where Eastwood plays with the changing nature of the American population, while Invictus (released in December, 2009), with Morgan Freeman, deals with the challenge of pulling together the racially divided nation of South Africa. Mann's Chinese Theatre, Hollywood, California. Clarence Nash / Donald Duck Forecourt ceremony, Wednesday, May 21, 1984. A character as large as Donald Duck needs a large block of cement.